I've been negligent in mentioning this, mainly due to the fact that the blog app I've been using on my iPhone to blog the con not having the functionality to do links easy (we'll forget my laziness in not wanting to type out the url), but we got another author talking about us! Robert J. Sawyer was cool enough to give us a mention on his blog the other day when our editor Rich dropped him a line about the project. Mr. Sawyer is a well known and respected author and futurist, and he's got a new TV show being adapted from his novel FlashForward set to go on ABC soon. 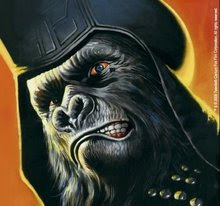 He's a big fan of the POTA movies, and from his reaction to the news of our novels, I'd say we caught his interest. Among the many fans and convention-goers who stopped by over the weekend was Lou Anders, editorial director for Pyr Books. Lou had given us a mention last week on his personal blog, and along with the many other things he was doing at San Diego, he was out and about conducting quick interviews for the podcast Adventures in SciFi Publishing, of which I was one (my first for this project). I'm not sure if I will make the cut or not, but don't let that stop you from checking out the podcast. Hosts Shaun and Sam do an excellent job of bringing you entertaining and informative interviews and industry news, and if you have any interest in SF/F publishing and how it works you should check out the show archives, it's a treasure chest of awesome advice. I know Sam was at the convention, and she was on my list of people to track down and stalk--uhm, I mean talk to, but I sadly didn't get the chance. We were both wearing orange shirts. I was much less action oriented in the picture he took of me, however. I'm thinking it was just a coincidence. 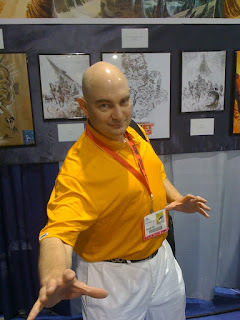 I still have a couple of bits left over from SDCC, not all necessarily Conspiracy related, which I'll put up tomorrow.